Of course there are stories to tell, but they’ll have to wait for tomorrow, because I’m tired. Truman is sleeping in the crate right next to me, and if I expect to get in some shut-eye before he emits his first “take me to pee!” noises, I’d better jump into bed now. oh my gosh, jenny, truman is ADORABLE!! sooooo cute! hope you managed to get some sleep tonight…but then again you probably got the puppy that sleeps thruogh the night on his first try 🙂 have fun with him! !i was walking up from lower campus late last night and there was a family walking their two huskies and a black lab. i definitely stopped and made a big commotion about the cuteness of the labbie before continuing on! They’re soo cute and TINY! 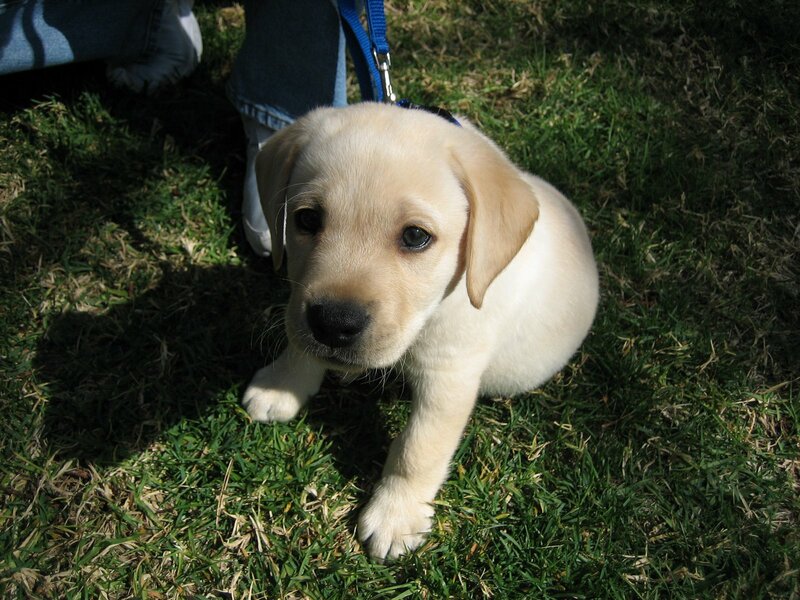 I want a small puppy when I get my next one! I’m almost as happy as you must be, sleepless or not. He is adorable. I’m printing out the photo of him sitting on the grass to send to my Mum, who is doing remarkably well and is out of the ICU. She lurves dogs too and when she gets home (it might even be in a week! ), I will send her your URL so she can read all about Truman growing up.